The French have a word, dépaysement. Roughly translated, it means the disorientation one experiences in a new culture away from one’s home country. It is an apt word to describe how I felt after leaving the Institut du Monde Arabe where I saw the exhibition “Les Milles et Une Nuits.” Just as a work of literature can be studied via different perspectives and approaches, so too it can be exhibited in a myriad of ways, as this exploration of the titular One Thousand and One Nights proved. Diffusion, translation, illustration, pop culture representation, along with more evidently literary concerns like themes, settings and characters, all were addressed in this monumental show featuring some 300-odd art objects, contributing to that aforementioned overwhelmed impression. “Les Milles et Une Nuits” proposes a voyage through time and space by following the travels of the centuries-old story collection. While it may be presented as the defining literary work of the Arabic-speaking world, on display are objects—manuscripts, publications, film clips, paintings—testifying to its international reach. This multiculturalism centers the expansive show, covering two floors and multiple galleries that cover themes as varied as the early Indo-Persian tales that would later inspire the Arabic texts; modern film adaptations; images of mystical creatures like genies; and the complex central character of Scheherazade. While objects ranging from medieval Arabic palace decorations and period arms and armor serve to illustrate these themes, the majority of works on display are manuscripts and published editions of the “One Thousand and One Nights.” Ranging across different countries and centuries, this collection best demonstrates the tales’ cross-cultural power to enchant that the curators are promoting. In the first gallery, medieval handwritten and illustrated Egyptian Coptic texts. Upstairs, François-Louis Schmied’s sensual, stylized prints that were published in 1927 alongside Joseph-Charles Mardrus’s French translation. These varied examples evoke the transformation the stories have undergone, from their Arabic culture of origin to the Western nations that have adapted and exoticized them. 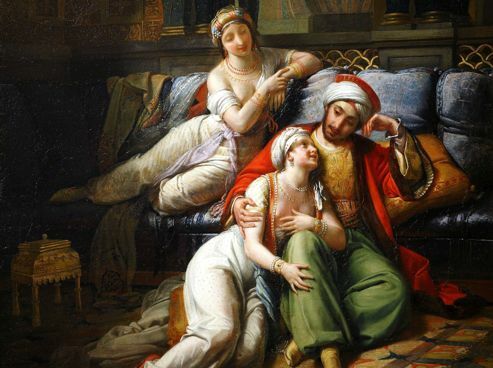 They serve as a mirror of the reader and of the reader’s (mis)conceptions of the Arabic world; Scheherazade and her fellow female characters, for example, are just as likely to be depicted as strong women, subverting the power of the king with their story-telling, as they are Oriental princesses lazying about in the lap of luxury (consider Jacques-Émile Blanche’s Ida Rubinstein dans le rôle de Zobéide dans le ballet “Shéhérazade” from 1911). This free-wheeling cultural mélange offers up a double opportunity, obviously to better know the “One Thousand and One Nights” but also to discover work not always highlighted in major mainstream institutions. I had never thought much—nay, never really knew it existed—about the specific style of 15th century commercial Turkmen manuscript illuminations. Here, though, thanks to illustrations of various events from the tales, was an excellent chance to delight in the minute details, geometric space, and schematic structures that characterized this Eastern art. “Les Milles et Une Nuits” is a feast for the senses — and not only the visual. In the middle of the exhibit, as the visitor progresses towards the upper floor, is a circular listening room where, lights dimmed, in a private booth, one is invited to get lost in one of these famous tales, read aloud in French and Arabic. A moment of calm, of repose, away from the cacophony of the other galleries that teem with diverse objects, to refocus attention on the rich, universal story-telling tradition at the heart of this grandiose exhibition. Rebecca Park is a freelance art critic based in Paris. Her work has been featured in various publications, including Glass Quarterly, Diplomatic Courier, artcritical, and make/shift. She also publishes a blog, Art Thoughts.